I hate itineraries. I prefer side roads to freeways. I’m uncomfortable at hotels where you’re not expected to carry your own bags. I love watching the sun rise and set every day that I’m away from home. I have never laid out on a pool chaise and had someone bring me drinks, and I don’t have any plans to. Travel has never equaled relaxation in my mind. That’s what days off are for, lounging around in your pj’s until noon watching Colombo and Dr. Who marathons. 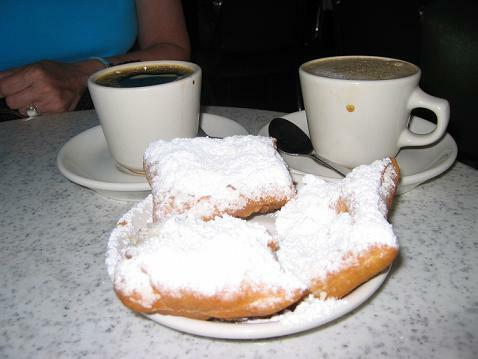 No, traveling is for going, for doing, for getting up at 6 a.m. and falling into bed at 2 a.m.
It’s for eating beignets for breakfast, lunch and dinner. 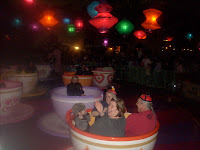 It’s for riding the teacups until you puke, then running around and getting on again. It’s for wandering for miles through the streets of Venice because you might miss something if you stuck to the map. Travel is for reminding you that life is for living, not for lying around. Gigi's so right! We should have a Pens trip to Europe! Couldn't you imagine us all there, trying to fit in word count before playing? Hooray for beignets! That picture makes me homesick. I love your travel philosophy. If you stick to a plan, you don't give yourself the chance to discover anything unexpected. One of the best beignets I ever had was in Boulder, CO. Sacrilege? Why is it that travel junkies always marry homebody folks? I want to do EVERYTHING our first day anywhere, but my partner wants to do at most ONE thing. I agree that wandering around without sticking to your map is the best way to get to know a place. You discover a lot of unexpected treasures that way. But sometimes, just sometimes, travel is about staying in an amazing B & B on Tybee Island, Georgia and watching eight hours of a Colombo marathon while lazily eating sliced fruit and cold cuts.